Just a quick note – I still haven’t solved the link list problem here, so this post with the PPBF link list is also located at my old blog today. PPBF bloggers, please leave your links in the comments below if you like and I’ll try to find time to add them to this post. Or pop over to the old blog and leave your link there! Oh, but one more thing before we all go off to enjoy everyone else’s PPBF picks and our weekends! Due to the incredible generosity of the people in the kidlit community, the prizes for the Valentiny Contest are rolling in! So be sure and check the contest post for updates – the prizes will knock your socks off and you will definitely want to work on your entries this weekend as a result! I like this book! 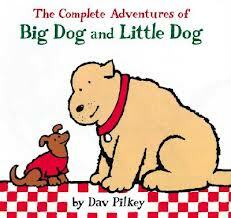 And one thing I know for sure is – if a little dog is little enough, then I can be the big dog. I’m pretty sure being the big dog super fun! Love this book! It brings back fond memories of reading it over and over and giggling with my daughters. The irony is, I now have a big and a little dog in my house and they did eat a couch! Go dog fans! I have to admit, I am biased and pick up dog books first, so I’m on board with you. I will be checking this out. It sounds adorable. I love dogs and dog books, so this sounds appealing! I commented on the other post! But, you have no idea how thrilled I am that you show up in my WordPress Reader. I used to pull my hair out at times because I had such difficulty with blogspot. WELCOME! And, I thoroughly enjoyed your review today! I am so familiar with Dav Pilkey and can’t believe I don’t know this series. Looks adorable. Dang…yours is one of those blogs that make me open it up on a new window/tab. Some days my internet will not be up to that kind of work. LOL! Happy Friday! I’m so confused. I just checked back in here, and I think I commented on your old site. Hope you’re enjoying the snow!